Jason wanted to improve the look of his upmarket car sales yard knowing that his high quality vehicles need to be presented in the best possible setting. We discussed putting a row of plants along the front and then adding in plants at the back which would create an illusion of the cars "floating" on the ramps. The stones required topping up and re-weedmatting around certain areas needed to be done. Having to break through concrete barriers to get to dirt in two areas, cutting weedmat to fit around unusual shaped curbing, tidying up stray weeds, washing down gutters, and raking stones to give it an even tidy look. The work was on a Sunday which was within a week from the initial consultation to ensure no disturbance to regular trade. Quotation: $780.00 + GST which included plants, additional compost, stones, weedmat, labour, tip fees for removal of dirt from planting, travel time for plant and material pick up. Jason was thrilled to arrive at work to a smart new garden having had no disturbance to his normal busy trading hours. Dr Deon Heyns moved to Australia but still had his beautiful home on Polson Hill Drive to sell so contacted us for the first time by email. We were asked to care for the lawns and gardens until it was sold. Our plan for the property was to co-ordinate with the Real Estate Agent ensuring we timed our visits to have the property looking pristine for Open Homes. The lawns were done by hand as it gave a better finish and so took 2 hours to mow. Gardening was done on a weekly basis. A Blow vac was used on all pathways to create an instant tidy look. Shrubs were trimmed into topiary shapes to keep them looking groomed. The house was given a fresh wash down with a hose to keep it looking smart. Spraying of the weeds on the driveway was done regularly. Both the Real Estate Agent and Deon were delighted as the house sold quickly as it always looked immaculately groomed. The customer was delighted as we were able to time our visits before any open homes which meant the house sold very quickly. Each visit ranged between $150.00 - $250 + GST depending on the gardens needs. "After our initial email Jungle Tamers sent an email outlining what they could do and what it would cost. They were on the property within 5 days and they did an incredible job. We had regular photos sent to us and numerous comments from the Agents on how well the property looked. Jungle Tamers volunteered several extra services such as removing cobwebs from the outside of the house which we really appreciated". 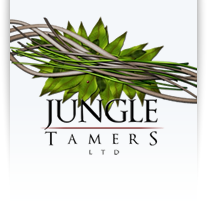 "We found Jungle Tamers extremely professional and the work they did was outstanding and I will recommend their services to anyone."